The APC is adding the Memorial Corridor to its Most Endangered Historic Places List. This traffic corridor connects the downtown area south of the Capitol to the east side, passing through layers of historic assets that vary from antebellum Oakland Cemetery, to turn of the century Grant Park and Cabbagetown neighborhoods, to mid-century modern assets. 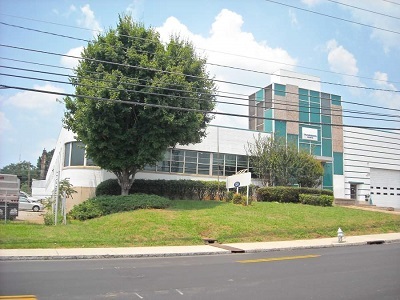 It is a place where neighborhoods, commerical areas and industrial buildings meet, a road that connects the inner city to the suburbs and incorporates mid-century school, dairies, office buildings and gas stations. 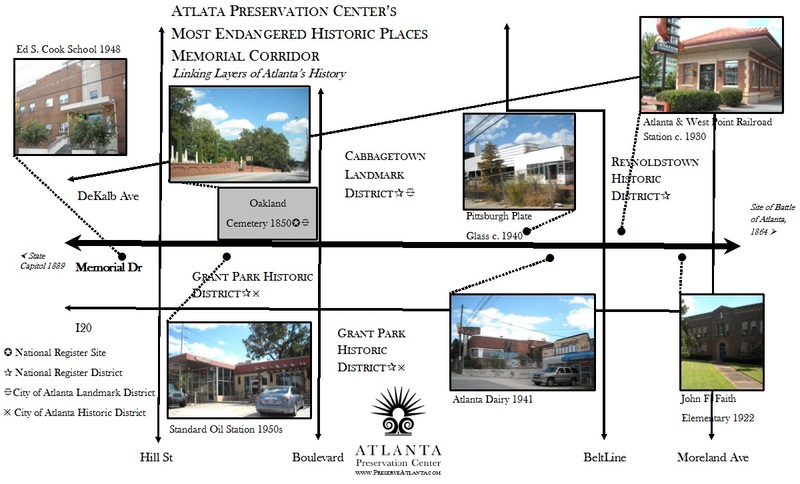 The portion of the Memorial Corridor that is of concern to the Atlanta Preservation Center begins at the previously listed (2011) Georgia State Archives building, proceeds east and covers Memorial Drive and the intersecting streets to the Moreland/Memorial intersection. Oakland Cemetery is the earliest remaining asset in the area, having been founded as the "Atlanta Cemetery" in 1850. The Atlanta Rolling Mill was established in 1858 o the site of what became the Fulton Bag and Cotton Mill (now the Stacks at Fulton Cotton Mill lofts). The eastern end of the corridor was part of the Battle of Atlanta during Gen. Sherman's 1864 Atlanta Campaign. During Reconstruction, industry and neighborhoods began and grew alongside Memorial Drive (then called Fair Street). There has been a school on the site of Ed S. Cook Elementary (originally Fair Street School, currently Wesley International Charter School) since the 1880's. The Grant Park neighborhood, platted in 1882 south of Fair Street, was laid out from the holdings of Col. L.P. Grant who donated the park by that name to the City. The Cabbagetown neighborhood evolved as a mill village in the late 19th and early 20th centuries. Both are protected through city designation as an Historic District and Landmark District, respectively. The boundaries of these protected areas, however, leave out significant structures which include Modernist buildings not eligible for designation because of the 50-year rule when the Districts were made in the 1980's and 1990's. John F. Faith Elementary (recently Tech High, now vacant) was built in 1922 at the eastern end of the endangered area and is an excellent example of Atlanta's early 20th century school architecture. The Pittsburgh Plate Glass Company building and the Atlanta Dairy building are both fine examples of the art modern style. The Beltline crosses the Memorial Corridor and is expected to provide wonderful opportunities for redevelopment. The APC is advocating for retention of the many historic resources present on the Corridor which provide a unique sense of place and, through adaptive reuse, could make this area a showcase for the principles of "Smart Growth." Designation of currently unprotected assets will make them eligible for tax incentives projects administered through the State Office of Historic Preservation. These are the pieces of Atlanta's significant built environment which bind the historic fabric of the Memorial Corridor. To find out more about available tax incentives please visit the Georgia State Historic Preservation Office. 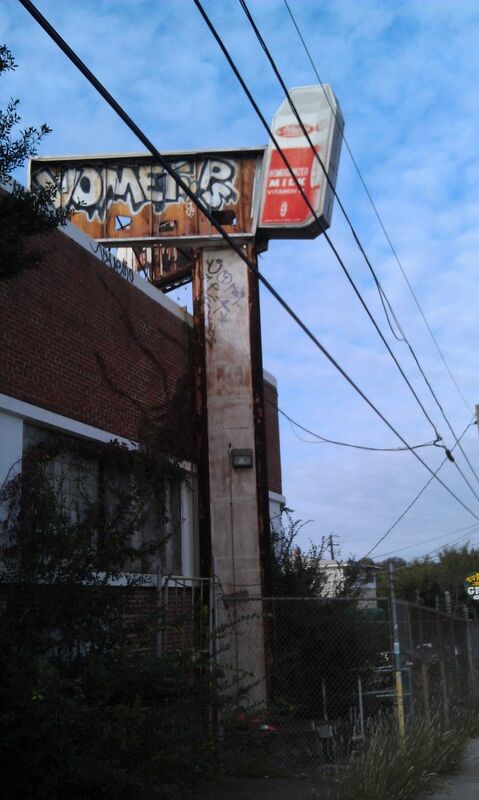 September 2014 UPDATE: Atlanta Dairy Building begins plans for redevelopment. Click here for more details. If you would like a closer look at the overview provided below please click here.